So last month I was lucky enough to be invited along by Chris at DADA to an exclusive menu tasting at The Kailyard restaurant at the Dunblane Hydro with Nick Nairn and I took along my lovely friend Marge (follow her on instagram @breakhearts_not_nails). The Kailyard opened in 2009 as a partnership between Nick Nairn and the Dunblane Hydro; the Kailyard is one of the most visited restaurants in the Dunblane and Stirling area and will do at least 1000 covers (number of people served) each weekend. 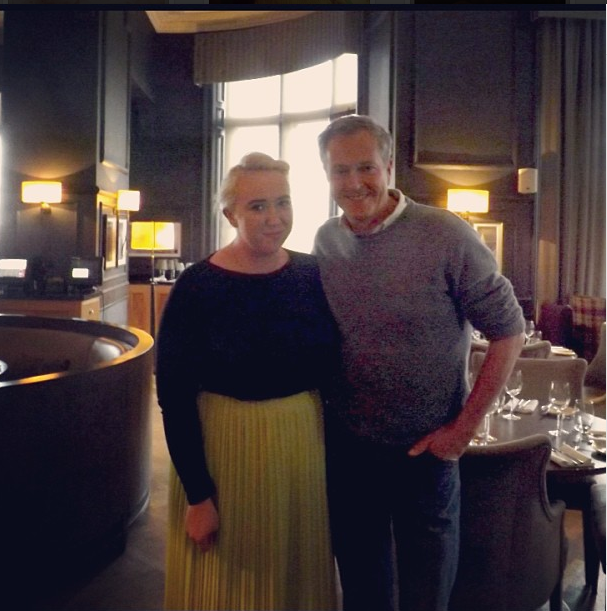 The event was a unique and exciting opportunity to meet Nick Nairn, finally taste some of the food from The Kailyard (I lived minutes away from the Hydro for 7 years and have never eaten there, I now live in Stirling which is still pretty close, it was definitely time to visit!) and to get more of an insight into the workings and thoughts of a professional celebrity chef. Firstly I must apologise for how late this post is, my memory card has corrupted (whatever that means) and I can't access any of the thousands of photos I had on it... So a massive thankyou to Kirstie from Coffee and Cakes for sending me over a few pictures to use for my post, she has saved the day for me! I'm going to start by saying that I honestly enjoyed everything we tried, which considering that two things I usually don't like prawn cocktail and fennel were on the menu, is no mean feat. We sampled eight dishes in total, the first four we tried were starters the first being the aforementioned prawn cocktail. If you know me well you'll know I hate tomato ketchup, I can just about bare it on a Burger King Whopper (classy I know) but in anything else it makes me want to heave... Prawn cocktail sauce and I usually aren't pals, what with it containing such a large amount of tomato sauce, it's not usually top of my foods I like to eat list, the prawn cocktail at The Kailyard however, I was pleasantly surprised by it, the sauce wasn't overly ketchup-y and there wasn't too much sauce either and surprisingly I really liked it, I'd even consider going back and ordering it! Shrimp cocktail with smoked salmon and avocado. Smoked salmon with pickled fennel and apple and a watercress salad- I really liked the freshness of this and the way the apple and fennel was pickled (in lemon juice). Glazed pork belly, crackling, apple sauce and crispy pulled pork fritters, so bad for you, yet so good! this was really good Marge and I went back for seconds! this was definitely one of my favourite dishes. It was comforting and rich and so good. Salmon and Seafood risotto; my favourite dish of the night, I love seafood and this risotto was simply perfect, when I go back I'll be ordering this, I loved the crispy seaweed on top too. Nick Nairn's Berry Trifle, how cute do they look in the little glasses! I love that The Kailyard menu is respectful of seasonality and local produce, and I'll definitely be recommending it to my friends and family, after all it's only a 10 minute train journey from where I live, it'd be a crime not to go back! A little fuzzy but you get the picture. Anyways I hope you're all having a lovely Tuesday, I'm busy working away at AJC PR today in my new position as a Social Media Intern, I'm really loving my second job doing what I love! Perfect foundation for up to 15 hours?! Really? Joanne McGillivary- One to Watch!